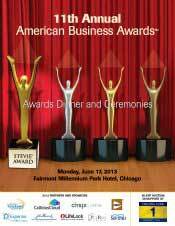 The Stevie® Awards are pleased to announce that the PDF of the official program of the first of two awards banquets for The 2013 American Business Awards is now available for download, at http://www.stevieawards.com/uploads/file/ABA13_Program_June.pdf. Recognized as the nation’s premier business awards program, the first of two awards banquets for The 2013 American Business Awards will take place on Monday, June 17 at the Fairmont Chicago Millennium Park Hotel. Get tickets for the event here. The program will be distributed to and downloaded by more than 15,000 executives over the coming year. Can't make the awards gala? Download the full program here and listen to a broadcast recording of the June 17 awards presentations on Wednesday, June 19 at 8:00 pm ET. The 5:00 pm ceremony will be taped and broadcast on Thursday, June 20 at 8:00 pm ET. Business Talk Radio will also simulcast the broadcasts on their web site, at www.BusinessTalkRadio.net. On their web site you'll find a list of the radio stations in the U.S.A. that carry BTR programming.